The Affordable Art Fair New York opened last Wednesday in Chelsea and runs through the weekend. This popular art fair, versions of which run in multiple American and international cities, is clearly (based on my observations over many years) one of the key venues to acquire reasonably-priced art, both by new collectors as well as seasoned collectors looking for new talent. I will also admit that this is one of my favorite art fairs on the planet: cool, trendy, well-organized, and superbly run. As most seasoned art critics, artists, gallerists and art symbiots know, when you walk through art fairs over a period of years, in diverse cities and settings, often trends and connecting lines appear that are clearly obvious to the most casual observer. The trend here this year seems to be an over abundance of pop art derivatives from artists all over the planet. There are also many artists, in all sorts of media and substrates, whom are rather effectively channeling the epic artists of the Washington Color School. There is stripe art everywhere, in every shape and form and drip factor! There are also multiple flat brushes channeling Carmen Herrera minimalist style, which remained ignored though most of her life until the Brits "discovered" her work a few years ago, and suddenly the octogenarian became darling of the New York art scene (she's currently at The Whitney). Warhol look-alikes are also all over the place, but this Warholian footprint is visible in every single art fair on the planet, from the most exclusive to the lowliest ABMB satellite fair. 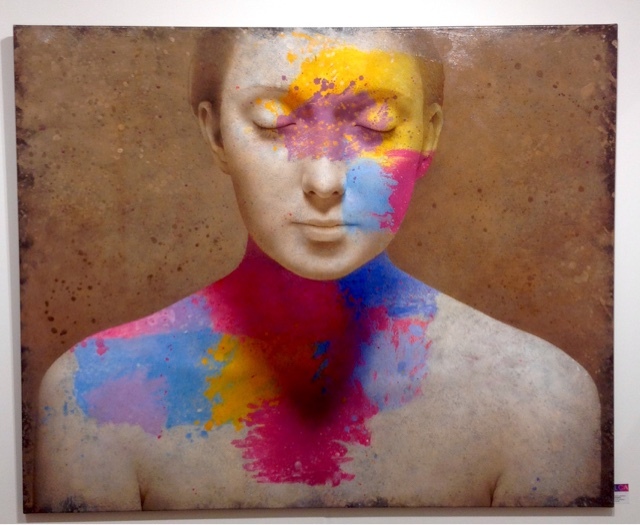 Overall though, the fair remains a cornucopia of really good talent at very good prices, and AAFNYC continues to earn its reputation as a solid, good art fair for both emerging artists and emerging galleries. And it is also a place where we also always see some of the top blue chip galleries in the world showcase their new talent. Michele Mikesell ("Enmascarado" is depicted above) shows with DECORAZON, which has galleries in both London and New York. I was immediately attracted to her work, which reminded me a little of the DMV's Matt Sesow or the early work of Alabama's Michael Banks. Mikesell's wet sanding process delivers a beautifully crafted oil painting whose images are intelligent, disturbing and hypnotizing. London Contemporary Art, obviously based in London, is showcasing the work of Michael Lukasiewicz, a very talented painter who could teach a lesson or two to the Washington Color School channellers about how a contemporary painter can stand on the shoulders of giants from the past and deliver something related, but fresh and new. Look at the way in his "Breathless" (acrylic and gesso on canvas) uses a little of Sam Gilliam's draped paintings color to offer a radical new approach to the use of color. 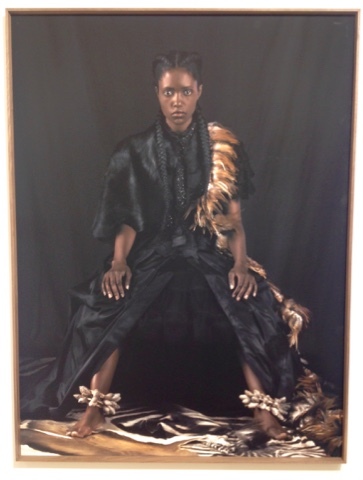 "Queen", depicted above, is from a series of gorgeous photographs by Dagmar Van Weeghel, represented by Amsterdam's The Public House of Art gallery. The power, presence and scale (very large photo) make an unforgettable impact from the very beginning. At the risk of revealing my childhood heroes, Conan The Barbarian is not too far from this powerful woman, and in some universe she might be his queen. 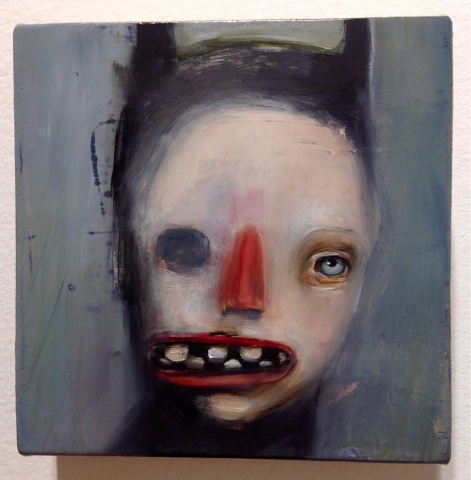 I also liked Marek Zya's sculptures with Carmel, Indiana gallery Evan Lurie, and the mixed media pieces by Ruben Ireland with NYC's CURIOOS gallery. The fair is at the Met Pavilion in Chelsea and runs through Sunday.